Amatrol’s DC Electronic Drives Learning System (85-MT102) covers industrial DC electronic motor drives used to provide accurate control of speed, position, and acceleration in applications like CNC machine tools, conveyors, robots, mixers, and presses. This system will cover major DC electronic drive topics like DC motion control, silicon controlled rectifier control, DC spindle drives, DC servo axis drives, DC pulse width modulation drives, and DC drive troubleshooting. 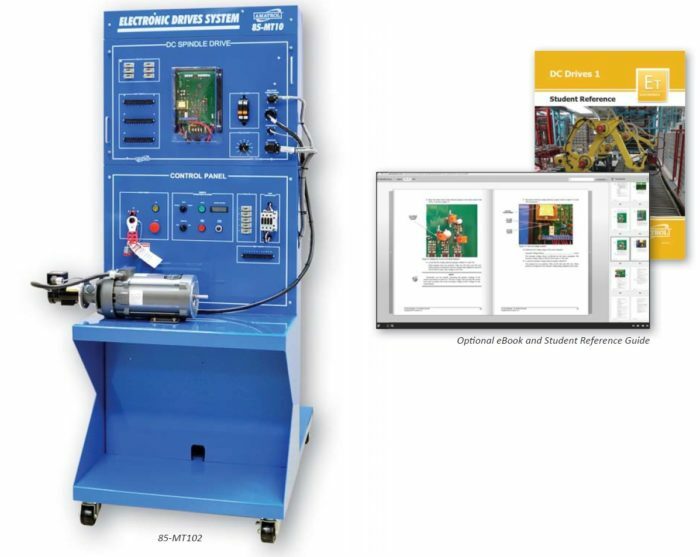 This learning system also trains learners how to troubleshoot electronic drive motor control circuits under realistic conditions with circuit faults that can be introduced throughout the system. The 85-MT102 includes a mobile training console, power supply, isolation transformer, control panel with control components and instrumentation, DC spindle drive panel, DC servo axis drive panel, DC PWM drive panel, DC shunt wound motor (1 HP), DC permanent magnet servo motor (1 HP), and resistive load unit. The 85-MT102 offers a variety of drive and motor brands and models to give learners a comprehensive learning experience that will better prepare them for what they’ll see in the field. This system uses industrial quality components for durability and to help learners become acquainted with what they will encounter on the job. The 85-MT102 features manually inserted faults that allow up to twenty-three faults to be inserted throughout the system, including inside the drive as well as to external wiring and components. Terminal strip test points are available at key locations to aid learners in their DC drive troubleshooting process without causing damage to the equipment. Specific skills include troubleshooting a DC spindle drive using a manufacturer’s documentation and troubleshooting a DC servo axis drive using troubleshooting tables. This learning system teaches the operation and characteristics of each drive under load conditions similar to what the drive will be subjected to in a real-world application. Learners will use the system’s real-world components and realistic load conditions to practice hands-on skills such as: controlling the speed of a DC motor using armature and field control; adjusting the firing angle of an SCR; checking the output of a tachometer using an oscilloscope; connecting and operating a DC base-speed motor; and calibrating a DC PWM drive. The DC Electronic Drives Learning System features a modular system design with interchangeable drive panels, so learners can easily set up diff erent types of DC drives. Panels not in use store conveniently on the back of the workstation. Learners will study industry-relevant skills including how to operate, install, tune, and troubleshoot three major types of DC drives: DC spindle drives, DC servo axis drives, and DC pulse width modulated (PWM) drives. Specific learning topics include two methods of reversing the rotation of a DC motor; the operation of a variable resistance SCR timing circuit, the function of voltage feedback in a DC full-range drive, and the construction and operation of a power bridge circuit in a DC PWM drive. In addition to the included printed curriculum, Amatrol also offers this course in an online eBook format. Amatrol’s eBooks provide easy, quick navigation and searchable course content in an online, computer-based format. If you need to teach AC drives in addition to DC drives, Amatrol offers the AC Electronic Drives Learning System (85-MT101). The 85-MT101 teaches industry-relevant skills for AC electronic motor drives including how to operate, install, tune, and troubleshoot three major types of AC drives: AC vector-type spindle drives, AC servo axis drives, and AC variable frequency drives. A sample copy of the DC Drives 1 Student Reference Guide is also included with the system for your evaluation. Sourced from the system’s curriculum, the Student Reference Guide takes the entire series’ technical content contained in the learning objectives and combines them into one perfectly-bound book. Student Reference Guides supplement this course by providing a condensed, inexpensive reference tool that learners will fi nd invaluable once they finish their training making it the perfect course takeaway.